It’s time to start creating a weekly bouquet of garden flowers to enjoy. 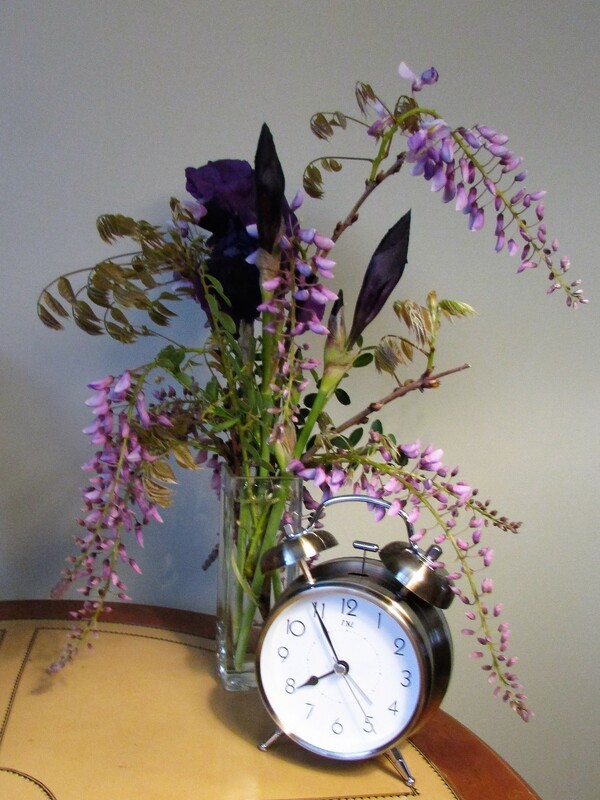 This week I chose the wisteria and iris that are beginning to bloom in my garden. Both of these spring blooming flowers are great for arrangements, and with their substantial stems are easy to use. Remove any leaves that will be below the water line. Cut stems at an angle, and if you’re really ambitious cut straight up the bottom of your wisteria stem to allow more water to be drawn up. It’s best to choose iris buds ready to unfurl. If you cut these stems underwater they will last even longer. An added bonus is the spectacular fragrance of both these flowers. Astonish yourself and create your own springtime bouquet! Beautiful bouquet! Love the purple! I like your contained wisteria and rather dread the battle with mine. Mine needs several prunings each year. The fragrance right now is amazing…so today I am in love with it. We have a few spindly leaves on the top of the pergola. Not impressive. In town the other day, I saw a huge vine dripping with magnificent blooms. Has mine gotten the message? No. Yes, it could be a slightly different plant, but it could be ours is defective or vengeful. Or maybe waiting for the perfect opportunity. I shouldn’t contradict you, but the only thing perfect about our wisteria is its ability to thumb its nose at me. It does sound like an ornery wisteria. It probably loves you and is like a child acting up to get your attention. Aarrggghhhh! I’m glad that menace has someone to defend it. I’ll take it greetings from you.